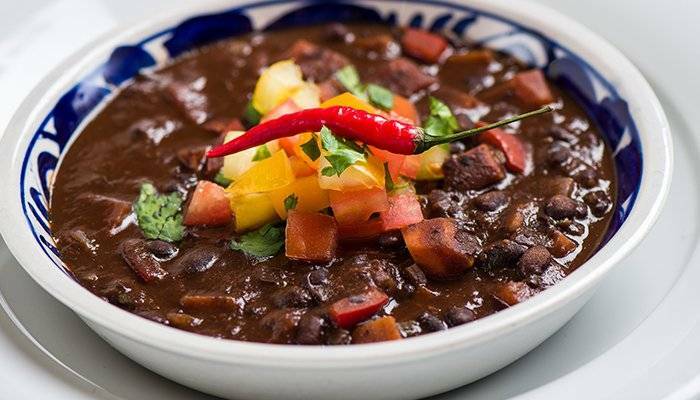 A deep, dark standard, this black bean soup recipe provides plenty of flavor while offering a complete bean and rice protein source. Try it blended for a smoother texture. This recipe for Black Bean Soup serves 4. Saute diced vegetables until tender in oil. Add tomato sauce, canned tomatoes, stock, and lime juice. Add cooked beans and rice. Finish with cilantro garnish and optional dollop of sour cream.